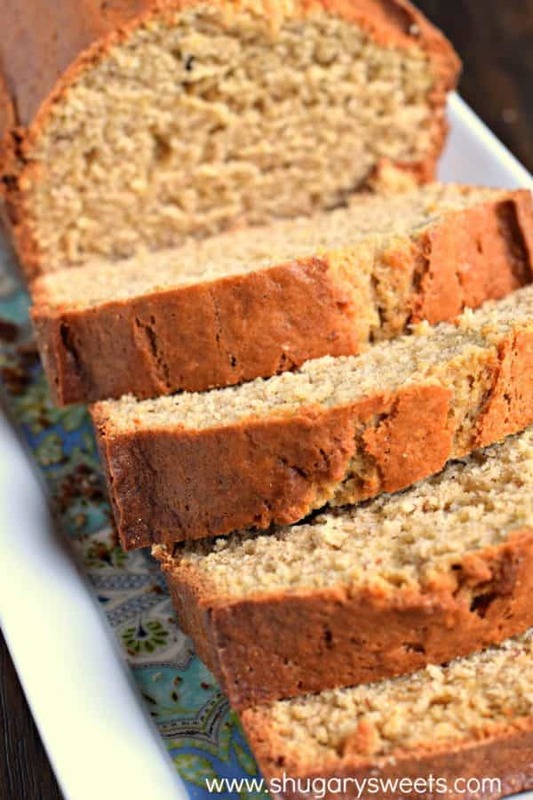 Banana Bread is one of those classic treats that everyone should have a go-to, killer recipe. I’ve been making mine this way since high school….when my mom handed me her recipe one day and asked me to bake some bread. Not sure where her recipe came from? Grandma? Betty Crocker? But, it’s truly my favorite. Depending on my mood, I’ll toss in some chopped walnuts for a little crunch. I personally prefer my Banana Bread with nuts, however, my family prefers it nut-free. Sometimes I say screw the family, momma’s making it her way…but not often, LOL. 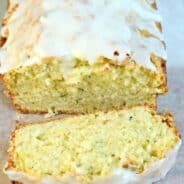 This recipe makes two loaves, which is great for sharing! Or, if you’re like me, wrap one up and stick it in the freezer. I do have one question though….are you a butter fan? I grew up spreading butter on my banana bread, and have only recently found out that not everyone agrees with this strategy of eating. I think the butter enhances the flavor, and I can’t imagine eating PLAIN bread. So….butter or no butter? 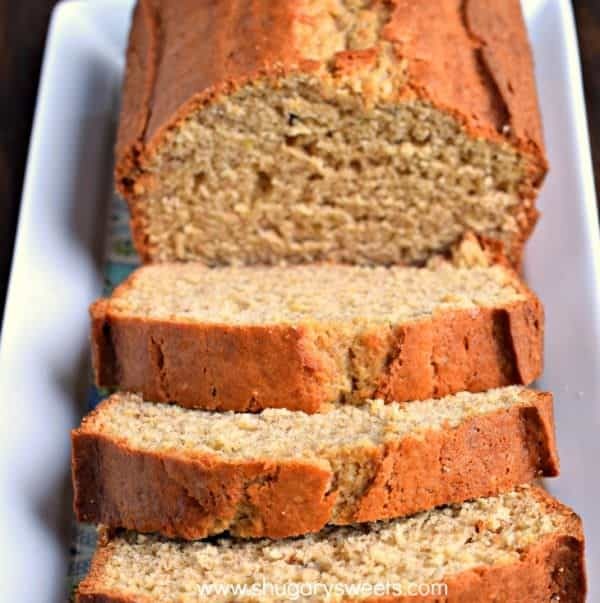 Delicious and easy, this Classic Banana Bread Recipe has been in our family for years. It's the perfect way to start your day and the bread is freezer friendly too! Preheat oven to 350°F. Grease and flour two 9-inch loaf pans. Set aside. In a large mixing bowl, beat butter with milk and sugar until blended. Add eggs and banana and combine completely. Add flour, baking powder, baking soda, cinnamon, and salt. Mix just until blended. Pour evenly into loaf pans. Bake for one hour. Remove from oven and cool in pans 10 minutes. Remove from pans and cool completely. Store in airtight container for several days, or freeze bread for later use. 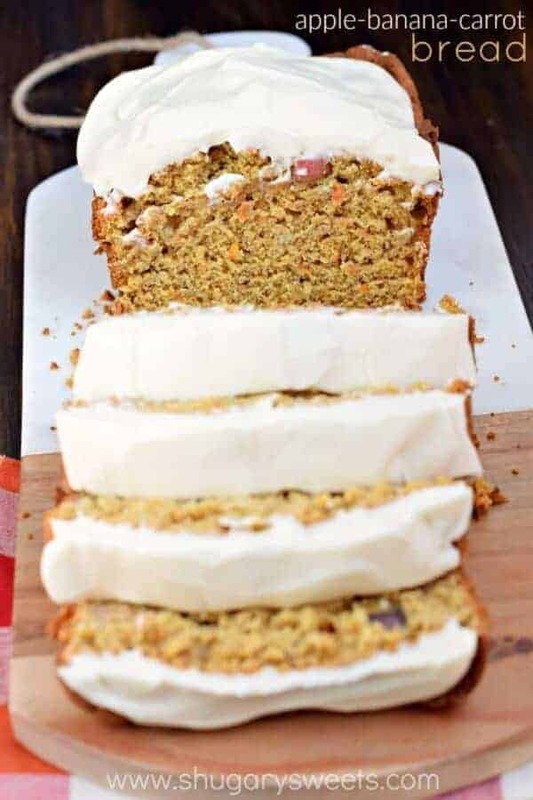 Apple Banana Carrot Bread: topped with a thick layer of frosting, of course! 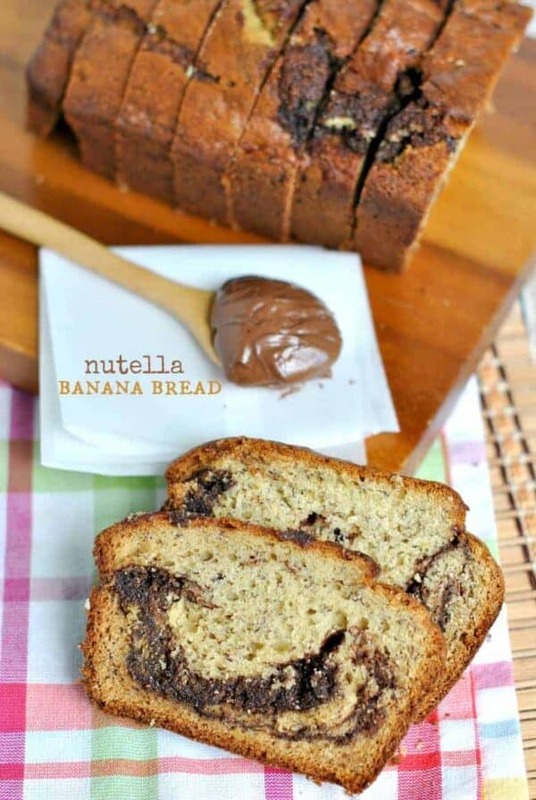 Nutella Banana Bread: the best combo, hands down! 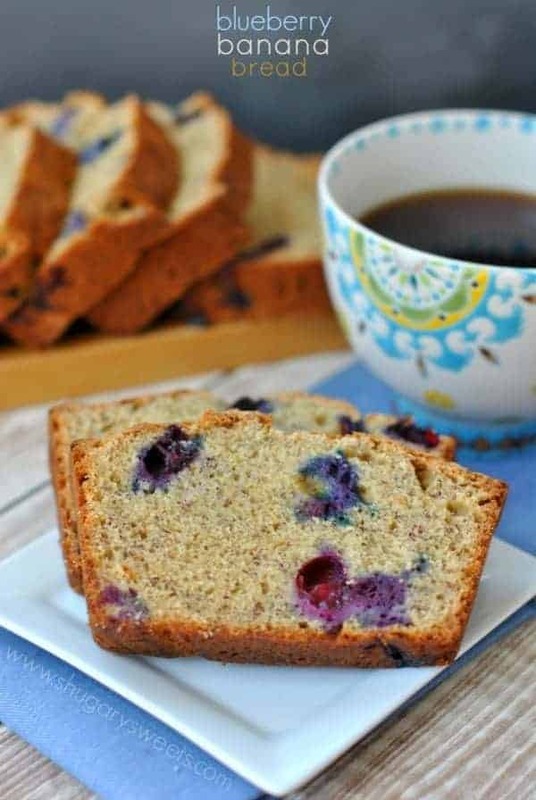 Blueberry Banana Bread: sweet blueberries add flavor and color to this classic bread! 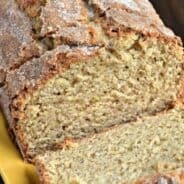 I have never buttered banana bread! Honestly, never occurred to me. But PEANUT butter on banana bread is something I have often gotten behind. It’s so good! I’m guessing regular butter isn’t too shabby, either. This looks perfect! 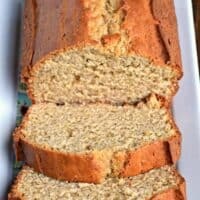 Butter + Banana Bread = YUMMY! Do it all. the. time. You are not alone! 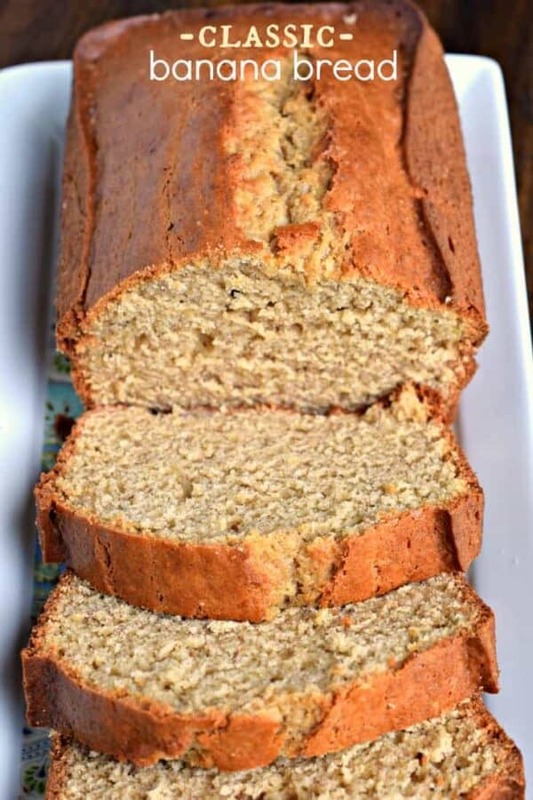 Give me all the banana bread slathered with butter…it’s sooooo good that way!!! Warm banana bread right out of the oven, slathered with melting butter…..doesn’t get any better than that! Add chocolate chips to the batter…you’re welcome. Definitely butter on banana bread! YUM! My Gram used to add finely chopped dried apricots to her banana bread. So good! Oooh, I may have to try that! Butter…hot out the oven and on the heels of the loaf!! Peanut or almond butter after its cooled. Tried your recipe this time with a few substitutions… coconut oil for the butter, almond milk for the milk and 1cup honey for the two cups sugar. Threw all the wet ingredients in my Ninja blender and gave it a whirl on puree. Subbed 1 cup of the flour for 1 cup of Kodiak cakes Super Foods flapjack and waffle mix. Turned out well. I have been trying to take some of my classic comfort food recipes and putting a healthier spin on them. I love this recipe! 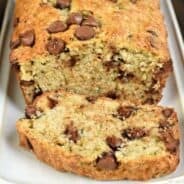 I can’t eat uncooked bananas due to a pollen allergy but I love the flavor, and this is my go to cooked banana recipe. If you’re cholesterol conscious, you can sub two of the eggs for unsweetened applesauce and it’s just as good!